Shortly after noon on November 22, 1963, President John F. Kennedy was assassinated as he rode in a motorcade through Dealey Plaza in downtown Dallas, Texas. It’s been 53 years since the assassination. Since that fateful November day, conspiracy theories have abounded. However, when we sift through the disinformation and look at only verifiable facts, we find no need for theories — as the conspiracy was a fact. In 2015, while the world debated the Kardashians and Miss Universe, the CIA quietly declassified a report showing that former CIA director John McCone was complicit in withholding information regarding the assassination– a de facto conspiracy. As Politico noted, according to the report by CIA historian David Robarge, McCone, who died in 1991, was at the heart of a “benign cover-up” at the spy agency, intended to keep the commission focused on “what the Agency believed at the time was the ‘best truth’—that Lee Harvey Oswald, for as yet undetermined motives, had acted alone in killing John Kennedy.” The most important information that McCone withheld from the commission in its 1964 investigation, the report found, was the existence, for years, of CIA plots to assassinate Castro, some of which put the CIA in cahoots with the Mafia. Without this information, the commission never even knew to ask the question of whether Oswald had accomplices in Cuba or elsewhere who wanted Kennedy dead in retaliation for the Castro plots. “If the commission did not know to ask about covert operations about Cuba, he was not going to give them any suggestions about where to look,” the CIA report notes. While the report may be referred to as ‘benign’ by the CIA as an attempt to downplay its significance, it was a cover-up nonetheless — a cover-up that halted any further investigation into Oswald and his potential ties to Cuba and any of his possible connections or accomplices. McCone’s conspiracy effectively rendered any further investigation into Oswald impotent as he directed the CIA to only provide “passive, reactive and selective” assistance to the Warren Commission. In fact, the report notes that McCone attempted and was successful at steering the direction of the investigation into his sole control. Initially stamped “SECRET/NOFORN,” meaning it was not to be shared outside the agency or with foreign governments, the report makes no mention as to why McCone was motivated to go to such great lengths to cover up this information. However, it does suggest that the White House may have directed him to hide it. 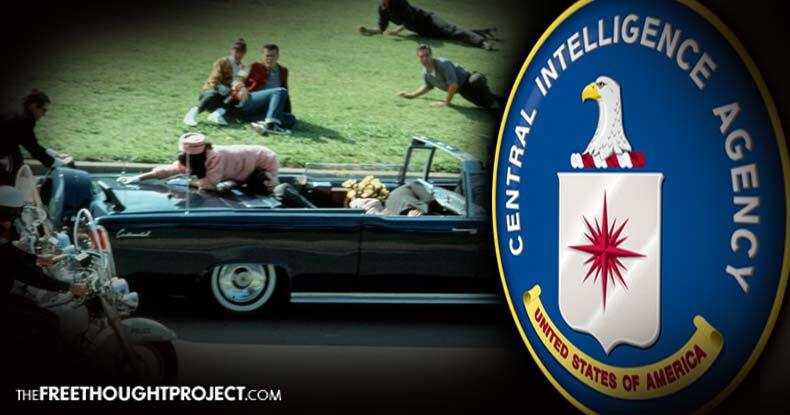 Outside of the bombshell admission of a CIA cover-up, the report also admits that the CIA was actually in communication with Oswald before the assassination, and the spy agency had been secretly monitoring his mail. As the corporate media remembers JFK, you can rest assured that they will most certainly avoid any mention of this report. While it is certainly not the holy grail, it does add credence to the fact that the overwhelming majority of Americans do not believe the official government story — as they have every reason not to trust a word the CIA says.